Dr. D. S. Margoliouth recently called attention to a noteworthy fact, namely, that Islam in theory offers no facilities to those outside of its pale for the study of its character before they enter. "A man must enrol himself as a member first," he writes, "and then only may he learn what his obligations are. The Koran may not be sold to Unbelievers; soldiers are advised not to take it with them into hostile territory for fear the Unbeliever should get hold of it; and many a copy bears upon it a warning to Unbelievers not to touch. Pious grammarians have refused to teach grammar to Jews or Christians, because the rules were apt to be illustrated by quotations from the sacred volume." In how high a degree the Arabic language is to Moslems a wholly sacred language, not to be lightly regarded nor taught to unbelievers, one may learn from the commentaries on Surah Yusef, the first verse. "Those are the signs of the perspicuous Book. Verily we have revealed it, an Arabic Koran. Haply ye may understand." Et-Tabari, commenting on this verse, says: "God Most High caused this noted Book to come down an Arabic Koran to the Arabs, for their tongue and speech is Arabic. We, therefore, revealed this Book in their language that they might be wise and fully understand." The Arabic Koran is to-day the one sacred text-book in all Moslem schools in Turkey, Afghanistan, Java, Sumatra, Russia and China, as well as in those lands where Arabic is the mother tongue. Yet to three-fourths of the Moslem world Arabic is a dead language; for Islam spread even more rapidly than did the language of the Koran, and in consequence the Moslem world of to-day is polyglot. The chief literary languages of the Moslem world next to Arabic are Persian, Turkish, Urdu and Bengali. In all of these, and in other languages, there is a large Moslem religious literature—dogmatic, mystic and controversial. Yet the question whether the Koran itself might be translated into other languages has always been contested by the orthodox party. It is true that Mohammedans have themselves prepared a number of translations, or running comments on the sacred text, as interlinear notes, but such copies of the Koran are expensive and rare. An interesting correspondence was carried on in the columns of the Orient and Occident1 a few years ago between Sheikh Mohammed Hasanein El Ghamrawy, a student at Oxford, and the editors, in regard to this question. The former laid down the chief reasons why the Koran was not translated into foreign languages by Moslems in the earlier days, and, secondly, what had been the motives that led to its translation into Persian, Urdu and Turkish in recent times. He speaks of the translations of the Koran as having been adopted rather as a preventive measure than to propagate the faith. It was intended, he says, "to keep the religion of Islam from losing its hold on countries where Arabic is little known." Islam has never had its Pentecostal gift of tongues. Before our Lord Jesus Christ gave the Great Commission, the Old Testament had already been translated into Greek, and to-day the list of the Bible Societies includes versions in four hundred and fifty-six tongues: the complete Bible in a hundred and twelve languages, the New Testament in a hundred and eleven more, and at least one book of Scripture in two hundred and thirty-three other languages.2 This list includes every language, and even every important dialect spoken in the Moslem world. The Bible, in contrast to the Koran, has this unique quality, that it can be rendered into all the languages of mankind without losing its majesty, beauty, and spiritual power. The secret lies in the subject matter of the Scriptures. In attempting to give as complete a list as possible of the translations of the Koran; we will deal first with those in the languages of Europe - in nearly every case the work of non-Moslems — and then with Oriental versions by Moslems and missionaries. I. - TRANSLATIONS INTO THE LANGUAGES OF EUROPE. The first translation of the Koran was due to the missionary spirit of Petrus Venerabilis, Abbot of Clugny (died 1157 A.D.). He proposed the translation of the Koran into Latin, and the task was accomplished by an Englishman, Robert of Retina, and a German, Hermann of Dalmatia. Although the work was completed in 1143, it remained hidden for nearly four hundred years, till it was published at Basle in 1543 by Theodore Bibliander. This version was afterwards rendered into Italian, German, and Dutch. A second Latin translation of the Koran was made by Father Louis Maracci in 1698 and published at Padua, together with the original, text, explanatory notes, and refutations. Concerning this translation Sale says,: "It is, generally speaking, very exact, but adheres to the Arabic idiom too literally to be easily understood." The notes, he adds, are valuable, but the refutations "unsatisfactory and sometimes impertinent." Later editions of Bibliander's text appeared in 1550, and 1721 (Leipzig). An Arabic-Latin Koran was also published at Leipzig in 1768 by Justus Fredericus Froriep, and another at Amsterdam in 1646. Andrew Du Ryer, who had been French Consul in Egypt and had a considerable knowledge of both the Turkish and Arabic languages, first translated the Koran into French. This was printed at Paris in 1647. The version is, however, inaccurate, and contains frequent transpositions, omissions and even additions (Sale). Later and better French translations have followed: by Savary in 1783, and Kasimirski (Paris, 1st. edition 1840, 2nd edition 1841, 3rd edition 1857). Both of these versions have been frequently reprinted in popular form. Another French version is that by G. Pauthier (Paris, 1852). As far as I have been able to learn, there is no translation of the Koran into Danish or Norwegian. A Swedish translation, however, was made by C. J. Tornberg in 1874, but is said to be very inaccurate. J. T. Nordling wrote a prize essay for Upsala University on the Swedish translation in 1876. A translation of one Surah, El Mi'raj, was made into Spanish in the thirteenth century at the request of Alphonso X., by his physician, Don Ibrahim, and a French rendering of this translation was made by Bonaventura de Seve. I have not heard of a complete translation into Spanish, nor so far been able to trace a translation of the Koran into Greek, although the Greeks have been in closest touch with their Moslem neighbours for many centuries. Early Hebrew translations are not unknown. We learn from the Jewish Encyclopedia that fragments of these translations are found, in a Bodician MS. (No. 1221); in a bookseller's list a volume in Hebrew is mentioned containing the Torah, the Targum and the Koran. A translation from Latin into Hebrew was made in the seventeenth century by Jacob b. Israel ha Levi, Rabbi of Zante (died 1634). In modern times a translation was made into Hebrew by Heripann Reckendorf and printed at Leipzig, in 1857. The first German translation was made from the Latin. Other translations were made by Schweigger from the Italian version, at Nürnberg in 1616, and by Frederick Megerlin (Frankfurt, 1772). Sale's English version was translated into German by Theo. Arnold, and published at Lemgo (Germany) in 1746. The best known translations in German, however, are those by Boysen (1773), revised and corrected by G. Wahl in 1828, arid the most recent one by Ullmann (1853), which has passed through many editions. But, according to Nöldeke, none of the German translations are equal to those which we have in English. The first Dutch translation, "De Arabische Alcoran," was from Schweigger's version, and was printed at Hamburg in 1641. A later one was bade by J. H. Glasemaker from Du Ryer's version (and is still more inaccurate), and was published at Leyden in 1658, and six later editions. The copy I possess is dated 1734, "Zijnde de zevende en laatste druk." Another translation is that by Dr. Keyzer, Professor of Mohammedan Law at Delft, published at Haarlem in 1860. A Russian version appeared at St. Petersburg (Petrograd) in 1776. An Italian version, "Alcorano di Macometto," was made by Andr. Arrivabene at Venice in 1547, but is very incorrect, as it is from the Latin version of Robert Retenensis (Bibliander). 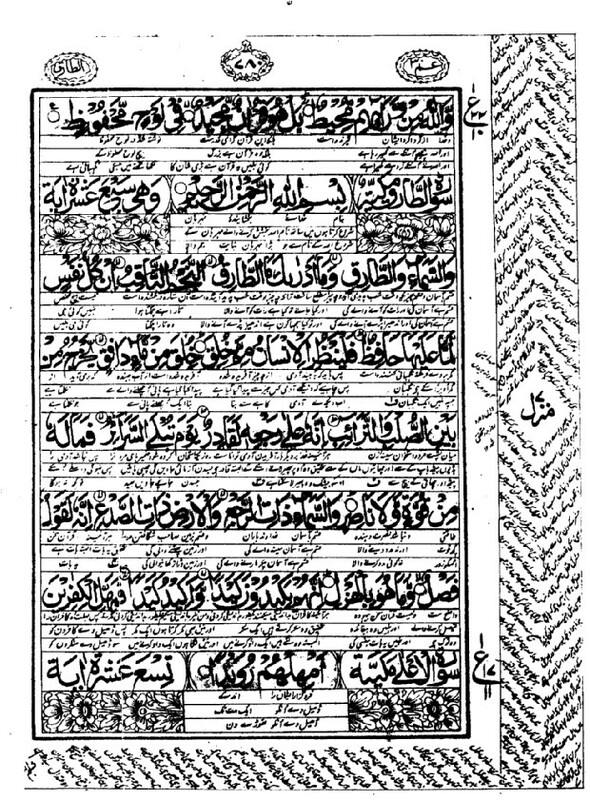 The most recent version in Ita1ian is a diglot Koran by Aquilio Fracassi, Professor in the Royal Technical School of Milano (1914). The preface gives an account of earlier translations, and is followed by a brief summary of the chapters and an explanation of their titles. As early as the fifteenth century Johannes Andreas, a native of Xativa in the kingdom of Valencia, who from a Muhammedan doctor became a Christian priest, translated not only the Koran, but also its glosses and the six books of the Sunna, from Arabic into the Arragonian tongue, at the command of Martin Garcia, Bishop of Barcelona and Inquisitor of Arragon.5 It is interesting to note this as perhaps the earliest version by a convert; we doubt Sale's statement regarding the Sunna! Finally we may mention a polyglot edition of the Koran (Tetrapla), prepared by the savant Andrea Acolutho of Bernstadt, printed at Berlin in 1701, in folio. This gives the Koran in Arabic, Persian, Turkish and Latin. The book is very rare. Kaj nenio en la mondo similas al Li." Ne de tiuj kiuj eraras." The first English Koran was Alexander Ross' translation of Du Ryer's French version (1648-1688). He was utterly unacquainted with Arabic, and not a thorough French scholar; therefore his translation is faulty in the extreme. Sale's well-known work first appeared in 1734, has passed through many editions, and is the most widely known of all English versions. He himself wrote: "Though I have freely censured the former translations of the Koran, I would not, therefore, be suspected of a design to make my own pass as free from faults; I am very sensible it is not; and I make no doubt that the few who are able to discern them, and know the difficulty of the undertaking, will give me fair quarter." Whatever faults may have been found in Sale's translation, his Preliminary Discourse will always stand as one of the rnost valuable contributions to the study of Islam. It has been translated into Arabic in recent years under the title "Makalat fi'l Islam," and is eagerly read by Moslems themselves. Sale's translation is extremely paraphrastic, but the fact that the additional matter in italics is, in nearly every case, added from the Commentary of El-Beidhawi, makes it the more valuable to the reader. This is the only complete English translation with explanatory footnotes, without which the Koran is scarcely intelligible. In 1861 a new translation was made by the Rev. J. M. Rodwell. In this the Surahs or chapters are arranged chronologically. Dr. Margoliouth characterises this rendering as one of the best yet produced. "Not the least among its recommendations is, perhaps, that it is scholarly without being pedantic — that is to say, that it aims at correctness without sacrificing the right effect of the whole to over-insistence on small details." But this version also has many inaccuracies, especially in the use of tenses and particles. "Behind such a one: is hell, and be shall be given to drink liquid pus! He shall try to swallow it, but cannot gulp it down." In addition to these the Bibliotheca Orientalis mentions an Arabic Koran lithographed at Serampore in 1833, with an English translation on the margin. We also have two English translations by Moslems, not to speak of a new translation which is promised by the editor of the Islamic Review. In 1905 the Holy Koran, translated by Dr. Mohammed Abdul Hakim Khan, with short notes, appeared from the press. This was printed in England. 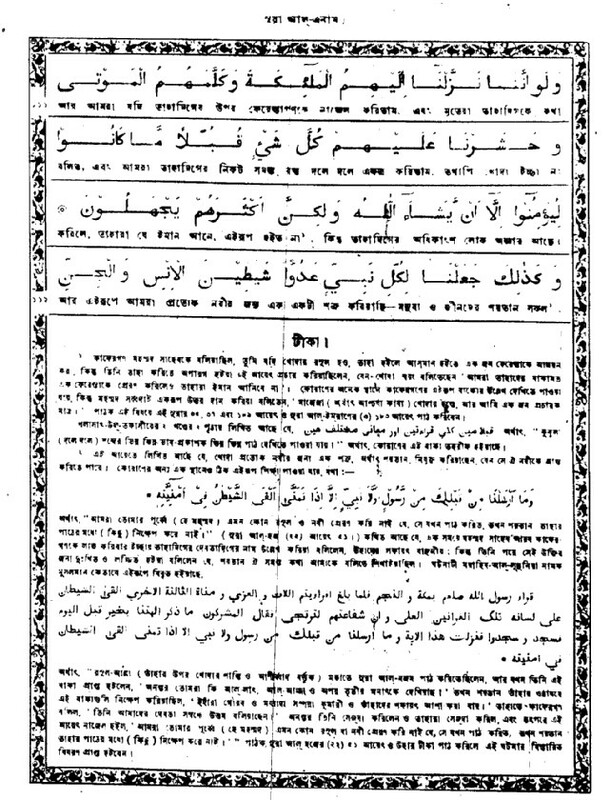 In 1911 Ashgar and Company at Allahabad published the Arabic text with English translation, arranged chronologically, by Mirza Abu'l Fazi. In the admirable abstract of the contents of the Koran, the author introduces his readers to the principles of textual criticism. The chronological order adopted differs from that of Muir, Rodwell and Jalal-ud-Din, although most nearly approaching the last-named. The English translation is vigorous, independent, and although sometimes crude and too literal, will perhaps on this very account prove useful to students of the Arabic text. The following are examples of such literalisms which offend good taste, but which give the Arabic original: "For you is a lesson in the cattle; we give you to drink of what is in their bellies"; "We will brand him on the snout"; or, where the angels came to Abraham: "And there came before them his wife with exclamations, and she beat her face and said: 'Old and barren me!'" But this is not a blemish in the translation unless it be a blemish in the original, and the translation of some of the earlier Surahs, such, as The Night, The Sun, and The Pen, are wonderfully well done. There are instances, however, where the author has shown his bias by a translation which is inaccurate, and, therefore, misleading. In the translation of two parallel verses, one referring to the death of John the Baptist and the other to that of Jesus Christ (Surah xix. 15 and 34), the same Arabic verb and tense is in the one case translated by the past and in the other by the future, to uphold the Moslem theory that Jesus Christ did not die on the cross, but will die after His second return :— "And peace upon him the day he was, born, and the day he died, and the day when he shall be raised up alive." "And peace upon me the day I was born, and the day I shall die, and the day I shall be raised up alive." To sum up the facts in regard to the English translations, the reader has the choice of no less than eight versions of the Mohammedan Bible, four of them by Moslems. "It goes without saying that an English translation of the Holy Quran with copious explanatory notes and exhaustive comments is one of the crying needs of the time. This is an age of religious research. Everybody is desirous of having the first-path information about the great religions of the world. And the need for such information is greater in the case of Islam than in the case of any other religion. No other religion has been so cruelly misrepresented as that of the Holy Quran. . . . Besides answering the objections of the hostile critics we intend to present to the readers of all creeds and nationalities a true picture of Islam, which alone of all religions can solve the greatest problems of the age by its universality, grandeur, simplicity and practicality." "It is with these objects in view that we have undertaken this translation of the Holy Quran. And nothing could serve this purpose better than such a reliable translation with necessary comments adapted to convey the true sense of the Holy Book and to remove the misunderstandings under which many of the people are labouring, thanks to the misrepresentations of the Christian writers on Islam. Indeed, there are already a number of English translations, but they are mostly by Christian writers, who besides being insufficiently acquainted with Arabic, could not totally free themselves from religious bias, and many of their notes and preliminary discourses are calculated to mislead the reader rather than enlighten him." For the comparison of four of these English translations of the Koran we give below in parallel columns translations of the Chapter of the Forenoon (XCIII. ), according to the versions of Sale, Palmer, Rodwell, and that of the Indian Moslem, Abu'l-Fazl. SALE. PALMER. RODWELL. ABU'L FAZL. By the brightness of the morning, and by the night when it groweth , dark: thy Lord hath not forsaken thee, neither doth he hate thee. Verily the life to come shall be better for thee than this present life: and thy Lord shall give thee a reward wherewith thou shalt be well pleased. Did he not find thee an orphan, and hath he not taken care of thee? And did he not find thee wandering in error, and hath he not guided thee into the truth? And did he not find thee needy, and hath he not enriched thee ? Wherefore oppress not the orphan; neither repulse the beggar: but declare the goodness of thy Lord. By the fore-noon! And the night when it darkens! Thy Lord has not forsaken thee, nor hated thee; and surely the hereafter is better for thee than the former; and in the end thy Lord will give thee, and thou shalt be well pleased! Did He not find thee an orphan, and give thee shelter? and find thee erring, and guide thee? and find thee poor with a family, and nourish thee? But as for the orphan oppress him not; and as for the beggar drive him not away; and as for the favour of thy Lord, discourse thereof. By the noonday brightness! And by the night when it darkeneth! Thy Lord hath not forsaken thee, neither hath he been displeased. And surely the Future shall be better for thee than the Past, and in the end shall thy Lord be bounteous to thee and thou be satisfied. Did he not find thee an orphan and gave thee a home? And found thee erring and guided thee; And found thee needy and enriched thee. As to the orphan, therefore, wrong him not; And as to him that asketh of thee, chide him not away; And as for the favours of thy Lord, tell them abroad. By the noonday brightness. And by the night, when it darkens. Thy Lord hath not forsaken thee, neither is he displeased. And surely the Hereafter shall be better for thee than the former; And in the end thy Lord will give to thee, and thou shalt be well-pleased. Did He not find thee an orphan, and give thee a home? And found the (sic) erring, and guided thee? And found thee needy, and enriched thee ? Then, as for the orphan, oppress not him; And as for him who asks, chide him not away. And as for the favour of thy Lord, tell it abroad. And fear no longer cajole thee. When thy feet went astray, were they not to the right path led? Did He not find thee poor, yet riches around thee spread? But of the Lord's bounty ever let praise be sung and said." One of the earliest versions of the Koran for the use of Moslems was the translation made into Urdu by the learned Sheikh, Abd-ul-Kadir Ibn-i-Shah Wali UIlah, of Delhi, in 1790. This has appeared in several editions, lithographed, with the Urdu text interlinear with the original.8 An Arabic-Persian interlinear in two volumes was printed at Calcutta in 1831; Brunet also mentions a lithographed Persian interlinear translation (Ispahan, n.d.). The latest edition is a polyglot Koran in folio, lithographed in two colours at Delhi by the Farooki Press, 1315 A.H., and entitled Koran Majid, Terjumat Thalatha. The introduction is in Urdu, and the interlinear text gives first the Arabic, followed by a Persian translation, an Urdu free translation, and an Urdu literal translation. The Persian translation, is by Shah Rafi'-ud-Din. A facsimile, reduced, of one of the pages of this beautiful volume, is given herewith. In addition to the text a running commentary is given on. the margin, both, in Urdu and in Persian. In Persian we have other editions of the Koran with explanatory notes on the text, or attempts at literal versions. A scholarly translation of the Koran into Urdu was also made by the late Rev. Dr. Imad-ud-Din, of Amritsar, India. This was the first translation to be published in Roman-Urdu characters, and through the Christian Mission Press at Allahabad it has been widely circulated throughout India. Rev. Dr. Ahmad Shah, S.P.G. missionary at Hamirpur, U.P., has recently given us the Koran in Hindi translation from the original Arabic. The language is said to be idiomatic, and the paragraphs are arranged according to the thought of the text. 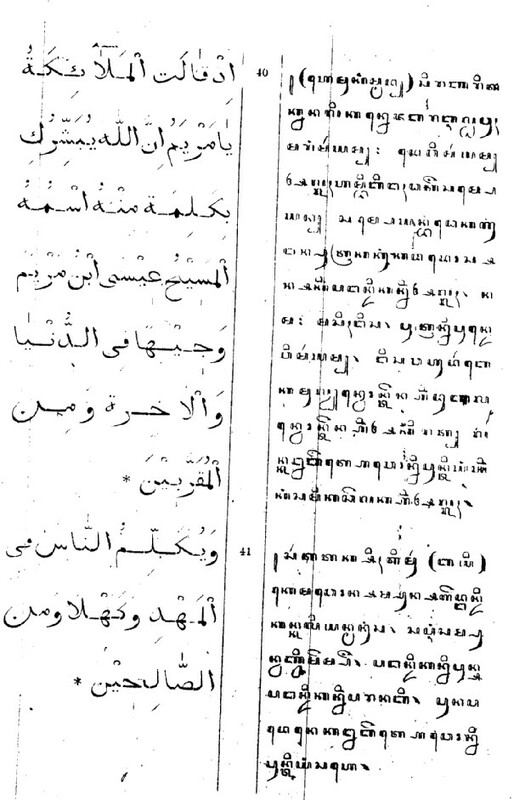 It is not generally known that the Malay version of Beidhawi's Commentary on the Koran contains an interlinear translation, sentence by sentence, with the Arabic text. Two or three editions of this commentary have been published, and it is sold throughout the Dutch East Indies. According to Hughes, a translation has also been made into Pushtu, and another writer speaks of one in Gujerati. I have not been able to secure information, however, in regard to these versions. From the Terjuman (quoted in the Revue du Monde Musulman, IV., 634), we learn that "Les Musulmans d'Adjari, aux environs de Batoum, et des régions avoisinantes, ne parlent et ne comprennent que la langue grouse [sic]. Pour faciliter leur instruction religieuse, le Coran à été traduit récemment dans leur langue; l'auteur de cette traduction se nomme Mir Yanichouyli." One would like to know more accurately concerning this version for so small a population. Some of these translations, however, especially the earlier ones, are not, correctly speaking, translations of the text; rather they consist of a commentary in the vernacular on the Arabic text, which sometimes is transliterated. A Chinese Commentary on the Koran is an example. In the Revue du Monde Musulman (Vol. IV., p. 540) a full account of such a commentary is given by M.F. Farjenel and M.. L. Bouvat. The work is in octavo, but gives neither date nor author's name. It is entitled. King han Tchou-kiai heueting (The Sacred Book explained in Chinese, and clearly divided into Sections. "The Chinese phonetic rendering, in this part of the book, is indicated after the Arabic text, and the. Chinese explanation follows. It is noteworthy that the Arabic text itself is not translated, the Faithful doubtless being supposed to understand it. 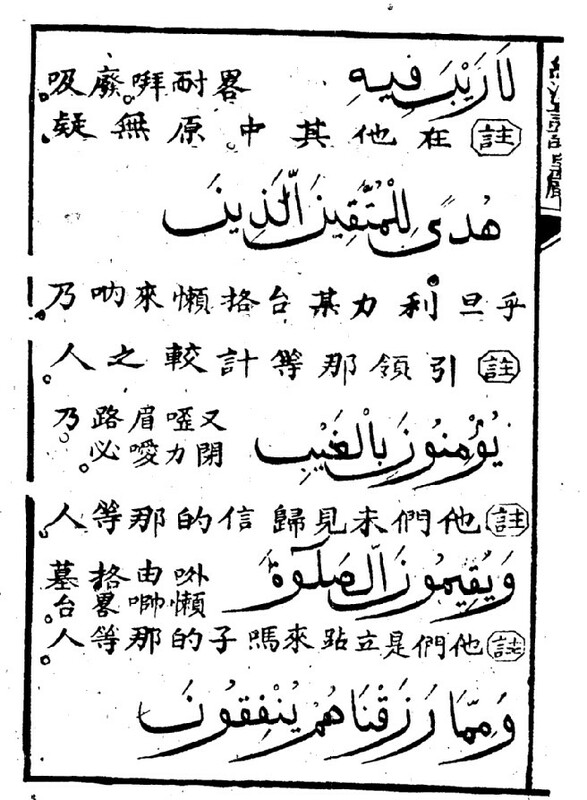 The notes in Chinese which accompany each Arabic phrase, form an annotated explanation of the prayer or of the text written in colloquial language. All the rest, after the Fatiha, is composed entirely of verses of the Koran, likewise translated into the language of the common people." To give the reader an idea of what such a translation means, we give below the comment on the words "King of the Day of Judgment," in the first Surah. Maliki yaumi'd-din. (In Arabic character). Ma li kee yao minn ting. (In Chinese character). "This expression has twelve Arabic characters. With the thirty preceding characters, this makes forty-two. On the basis of these forty-two characters. Allah has created forty-two kinds of diseases of the human heart. To every man who, during prayer, recites these words with true devotion, Allah will grant the cure of these forty-two moral illnesses." The word "Amin" (Chinese: A mi nai) is thus explained : — "This word has four sacred characters which designate four saints: Alif stands for Adam; Mim for Mohammed, the apostle of God; Ya for Yahya (John); and Nun for Noah. Those who recite these characters accurately will receive the honours and dignity pertaining to these four saints, on the Day of the Resurrection." A translation of the Koran in Javanese appeared in 1913 frdm the Semarang-Drukkery en Boekhandel, Batavia. It is issued in parts of about a hundred pages. The print and text are exceptionally good (see facsimile); the footnotes in Javanese are textual and not explanatory. This translation was made by Mr. Ngarpah, who calls himself "Servant of the Sultan of Turkey." He was once a Roman Catholic convert, and then turned back to Islam. The Javanese students at El Azhar were greatly interested in this translation when I showed it to them. An earlier translation in Javanese character is mentioned by Brill. In 1908 the Rev. William Goldsack, a missionary of the Australian Baptist Society, undertook the translation of the Koran into Bengali. It was a bold but strategic venture on literary lines, and has already had great effect among intelligent Moslems. The Koran printed in this fashion (see facsimile) with Christian comment and the explanation of difficult passages, can well be made, a schoolmaster to lead Moslems to Christ. One may hope that this method will find imitation in other mission fields and other languages. Efforts in this direction are sure to meet with opposition, as was the case with Turkish versions. "We must begin this (translation) at once, and show the people that it is possible to reach the authentic foundations of our religion. First in rank of these is the Koran. Till now the ordinary Turk read this, committed it to memory, said his prayers and had his communion with God, absolutely without understanding the sense and content of what he read or prayed. Naturally his readings and prayers made no such impression on his heart and soul as we should expect from the reading of a holy book and the recitation of a prayer. Reading and prayer were both mechanical; here was one of the principal causes of the impotence of religion as an educational force, and this obstacle must be removed. "It is this thought that has led to the translation of the Koran into Turkish; and the remarkable thing, and that which shows how ripe the time is for this enterprise is that the translation has been begun in quarters utterly at variance with each other in their tendencies. An entirely new religious era is opening in Turkey. We car already foresee that it will be big with beneficent results for the country; and the country is so ready, for such work that the protests against the translation have been remarkably feeble and have not even attracted genera attention." "To confer a favour upon my countrymen, I have decided to translate the noble contents of the Holy Koran into simple and smooth Turkish. It is true that earlier Turkish Commentaries on the Koran, or Korans with explanatory notes, have appeared, but all these works were published in obscure and classical style, and did not give the meaning of the text clearly, so our Moslem brethren received little benefit from them. In my youth I learned the whole Koran by heart and became a Hafiz. Even now, I can recite the Koran with the right intonations, but nevertheless I did not understand hardly a single phrase; and this is the case with hundreds of thousands among the Moslems. They have spent their youth in learning the proper recital of the Koran, have even learned it by heart, but of the meaning of the Holy Book they understand nothing. The foundations of our faith are unknown to them." "Truly the Koran did not descend from heaven merely as a masterpiece of beautiful Arabic eloquence. Non-Arabic speaking nations have rightly expressed the desire to know, what the book contains. Everyone cannot learn sufficient Arabic to understand the Koran, nor have, they time to wade through twenty volumes of Commentaries. Since I have for a long time laboured in my native, country with patriotic zeal for its intellectual and social reformation, I have now the special wish to give a version of the Koran in the language of the people. The translators have done their best to help all the readers, especially the youth at school, to a right understanding of the sacred text, and have, therefore, used simple language. The reader will not misjudge my religious object and my good intention in this work Even when the Turk reads his Koran in Turkish he will not abandon the use of the original text and the commentaries. May God bless my undertaking and this new translation." To sum up the result of our investigation. The Koran has been translated into twelve European languages, and, not counting the polyglot editions, we have in these languages thirty-four versions (no less than eight in the English language alone). In Oriental language we have been able to learn of some ten versions, and in the case of one or two of these the information seems doubtful. When we remember, that this work of translation has, with a few exceptions, been the work of Western scholars, Orientalists and missionaries, the contrast between the Arabic Koran and the Bible, the Book for all nations, is strikingly evident. And from the missionary standpoint we have nothing to fear from modern Koran translations; rather may we not hope that the contrast between the Bible and the Koran will be evident to all readers when they compare them in their vernacular? As long as orthodox Islam, however, retains its grip on the strategic centres of the Moslem world, it may be doubted whether the translations of the Koran made for Moslems by their own leaders will have any wide circulation. At Constantinople and Cairo the leaders still seem bound to discourage any translation of their Sacred Book. We are told that at Lahore, a well-known Moslem lawyer was recently speaking to his co-religionists in the Panjab on matters connected with Islam, and protested against this mistaken policy. "The reason why Christians succeed is because wherever they go they have the Bible and say their prayers in their mother-tongue; whereas we have wrapped up our religion in an Arabic dress. We should give the people the Koran and let them say their prayers in their own language." The only answer he received was, "Thou art thyself an unbeliever to say such things." 1 Orient and Occident, Cairo, February, 1907. 2 "Translations of the Bible," by Bernhard Pick, Ph.D., New York. American Bible Society. 1913. This volume contains a carefully compiled bibliography of 653 versions of the Bible, or parts of the Bible, which have been made since the invention of printing. 3 "Report of British and Foreign Bible Society," 1913-14. 4 Cf., Islam, 1903. P. 16. 5 Sale's" Koran," p. vii. 7 Cf. Jean Gay: "Biliographie des Ouvrages rélatifs à l'Afrique à l'Arabie," Paris, 1875. Brunet: "Manuel du Libraire" (art., Mahomet). J. Th. Zenker: "Bibliotheca Orientalis," Leipzig, 1861. 8 An edition in two volumes was printed at Hugly in 1248 (1829). The Muslim World, Volume 5, 1915 pp. 244-261.